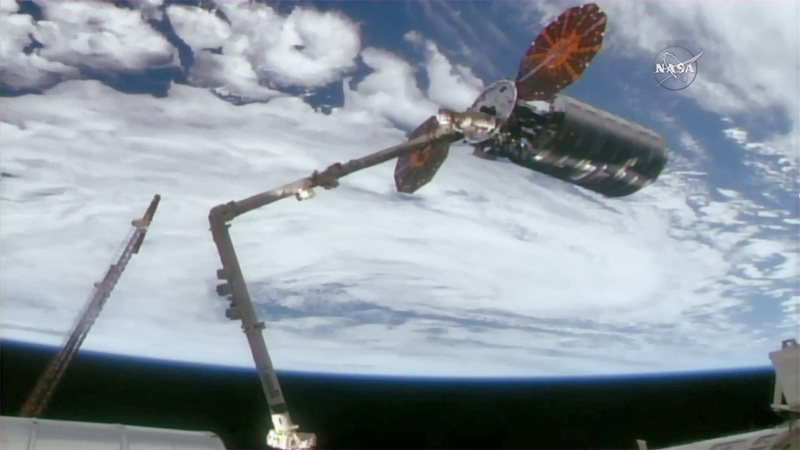 At 5:04 a.m., Expedition 53 Flight Engineers Paolo Nespoli of ESA (European Space Agency) and Randy Bresnik of NASA successfully captured Orbital ATK’s Cygnus cargo spacecraft using the International Space Station’s robotic arm. Robotic ground controllers will position Cygnus for installation to the orbiting laboratory’s Earth-facing port of the Unity module. NASA Television coverage of installation will begin at 6:15 a.m., and installation of the Cygnus spacecraft to the space station is expected to be completed later this morning. From my desk, so far from NASA, so silent, I enjoy and wonder of all your achivments NASA. You are a generator of knowledge and probe for all humankind that when we work hard as a team, forgetting our personal goals insted off comonwell, we can achive incredible targets. I have visited your museums in Washintong D.C., Cape Cañaveral, I had de honor to sow your last landing of the Atlants Shuttle that dark morning, I have my name on mars on the Phoenix Lander and is my dream to be present in your very first lounch off your brand new Speace Lounch Sistem and your Orion. Best Wishes All You NASA, keep going!!! I.M. E. Ernesto Muñoz Campos.